Let’s… GET IT ON! For REALS this time! Click here if you need to be refreshed on the game type and stipulations! Once you’re caught up, head right back here, cuz the results… are in! My first match was against Ninwashui. He was using AVX009e Cyclops, AVX010e Emma Frost & AVX014 Magneto. Oh, Magneto… I’d forgotten about you and your 20 Defense against ranged attacks. Eeeshh. When rolling for map, we actually tied. On the second roll, I beat him with my superior Theme bonus and took the battle to Wundagore, which ended up being a sizable advantage for me, since his characters had to walk around the long way. Cyclops was, frankly, toast, although in fairness, this was a terrible matchup for that figure. With no taxi, he was tokened by the time he got into the fight, and the Golden Falcon Special Terrain marker was right there to meet him. With the bonuses the Pharaoh gets because Cyke is a “Ruler,” the X-Men’s Fearless Leader went down like a sack of hot, moist and delicious potatoes. I was able to get one Mind Control through with Brother Voodoo on Magneto, but it ended up being an odd play. I blasted Emma Frost for a healthy amount of damage, but to do so, I had to move Magneto on a Running Shot to the place where Ninwashui probably would have wanted him anyway, so he could start going crazy with Pulse Wave. Luckily for me, my defenses were still pretty high, and even though Mags eventually whittled down Voodoo, Scarlet Witch and Astral Doc Strange, I still had a full Shaman and half an Iron Pharaoh left while Mags was double chipped with no other friendlies to TK anywhere (I think Mags was a couple clicks in, but I could be wrong). Time was called at that point, but it would have been interesting if the match had continued. I believe I still would have won based on where Magneto was at on his dial and the fact that I would have gotten in another Pharaoh attack or two before Magneto could go again (Magneto also buffs the Pharaoh since he too is a “Ruler”). –My strategy for why I built the team I built seems sound at this point. The movement advantage I enjoyed this round certainly paid off in delaying any confrontations until the Golden Falcon soared into the enemy. –Full dial AvX Magneto is redonkulous. His defense against ranged attacks borders on insane, especially when its combined with Invincible. No matter what angle of attack you take… he’s gonna be around for awhile. The fact that he can run a limited TK for free when he has two action tokens means that even when Mags couldn’t fly or carry, Ninwashui still had a half-decent taxi on his force. He’s got all that PLUS 11 Attack with Pulse Wave and an 8 Range on his first click. He’s a figure I should have been more prepared to face, given that he’s from the freaking AvX Starters. Still, I was taken a bit by surprise by just how powerful he was, particularly in a game that was designed to limit the usefulness of any figure that flies. –Oh yeah–Iron Pharaoh is really good. You probably know that, but I just thought I’d repeat it in case you’d forgotten. –Shaman’s “No Flights” spell is a FREE ACTION! Wow. Completely changes the game and it’s not even a power action. Unbelievable! While his no flying shenanigans were the inspiration for this team, his 7 range Perp along with his high defense against ranged attacks were just as important this round. Wanda, what was that? No, not–it’s “no more FLIGHTS!” Wait, which “no more” spell did you cast? For the second round, I played R, a player who’s just gotten back into the game after a long hiatus. Even though he’s still gaining familiarity with the new rules and pieces, he’s extremely adept at positioning his pieces and he learns very quickly. 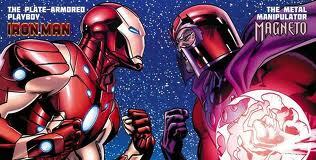 Last month, at the venue’s first AvX event, R defeated me soundly in the championship match. I missed some rolls (doesn’t everyone when they lose? ), but, to be frank, R outmaneuvered me at every turn that game. His tactics were simply better. This time, he was playing AVX003E Thor, WXM040 Hope Summers, AVX008 Professor X & AVX005R Wolverine. So how’d it go? As good a player as R is, this was an absolute nightmare matchup for him. We ended up marching on Wundagore Mountain again, and after another quick spellcasting by Shaman, R’s entire force was stuck on foot. To make matters worse, my two main attack pieces–Iron Pharaoh and Brother Voodoo–could either attack Professor X from more than 8 squares away or could use a billion different FREE actions so that the good Professor’s fantastically good Movement Special Power (I CAN’T LET YOU DO THIS: Professor X can use Mind Control and is not dealt unavoidable damage from it. Opposing characters within range must be given double power actions instead of power actions.) never went off. He killed Astral Dr. Strange and got Brother Voodoo down to his last click, but by that point the Pharaoh had run amok and Shaman had gotten into the fight (he can sling 3 damage with a range of 7 plus a Perplex he can float around to whoever needs it). –Once again, the strategy behind my build paid off. R’s team was solidly constructed; on most other maps, he would have been competitive and Professor X would have caused his opponent a LOT of problems. But the fact that a flier (Thor) was his main taxi and my team was stacked with a lot of Free Actions ultimately lead to his downfall in this match. –Shaman can do some damage! He’s great to set up your positioning, but he’s not afraid to mix it up himself. –Iron Pharaoh? Still good. FYI. This time I played B., another local regular. He’s a very skilled player who knows about the current Meta but actively prefers to come up with his own creative twists on what he plays. Today was no different. 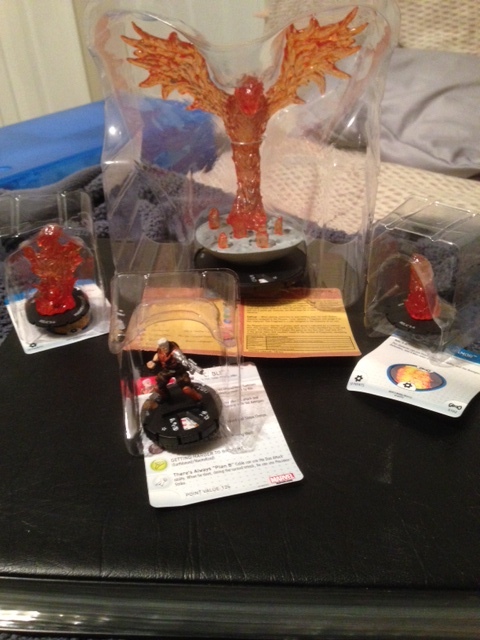 As we sat down to play, B revealed his force: AVX009 Cyclops, Tab-M004 Wolverine, WXM023A Deathbird and ASM022 Cloak. Can you guess which one of those four blew up my strategy? It was Cloak! Hadn’t even considered the possibility of facing him (even though he’s got the X-Men keyword!). But his Phasing Movement PLUS Traited Stealth and Carry were a giant headache to deal with for me. He’s only 55 points, but he has 6 (SIX!!) clicks and useful powers all the way down his dial. But I’m getting ahead of myself. Our match started with me finally LOSING map roll and B. choosing to take us right to the Savage Land side of the map. This side of the map had plenty of Hindering Terrain and Water but not much Elevated Terrain, which was really what slows people down after “No Flights” goes off. The other crappy part (for me, I mean) about losing Map Roll is that my opponent got to go first after choosing which side of the map we’d play on, which meant he’d get a taxi turn out of Deathbird before I could hit the NF button. That ended up being exactly what happened, as he used Cloak and Deathbird to ferry Cyke and Wolverine over to a four-square patch of hindering terrain to keep them safe. This wasn’t a very far advance at all, and it took them over to the other side of the map. On my first turn, I moved out my Falcon 3 squares, perplexed up Brother Voodoo Attack value with Scarlet Witch and Shaman and sent him out to take Cyke with his Traited Free Action Mind Control (I wanted Cloak, so I could separate him from the group, but his Stealth made him untargetable). With ES/D, Cyclops had a 20 Defense, but Brother Voodoo had a 12 or 13 Attack at this point with all the modifiers plus his own Prob Control, and I ended up hitting with the MC. In turn, Cyclops blasted Cloak for four (which, at the time, I thought would either kill Cloak or at least get him out of Phasing. WRONG!). So I got the Alpha Strike, but boy, would I pay for it in the next couple turns. My last action of the turn was to bust off “No Flights,” which was able to catch everyone in Hindering. Astral Dr. Strange was also sent into the fray, although it’d take a couple turns to get to his grouping. My last action of the turn was to bust off “No Flights,” which was able to catch everyone in Hindering. On his turn, he mostly de-chipped and/or got his forces out of Hindering (so that when he was ready to Run Shot or Charge, he wouldn’t also have to pay the Hindering Movement bonus). On turn 2, I moved the Falcon out a little more (although he had been careful with his positioning, so Pharaoh still couldn’t touch any of his figs) and tried to Incapacitate Cloak so that B. would have to push him if he wanted to Carry anyone. Even with Strange’s 8 attack I hit–and Cloak promptly hit his Super Senses roll. Tried to use free action MC again with Voodoo but missed. My opponent retaliated the next turn by blasting Voodoo with Cyke for four. 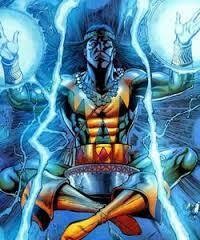 He then offed Strange’s Astral Projection with a Charge/Blades from Wolverine. My turn. I pushed Voodoo back to Scarlet Witch for a quick heal. The push sent Voodoo to his last click. I moved Wanda into position for a heal next turn. On B.’s turn, he looked at the map 10 different ways before he had to concede that he wasn’t going to be able to base Voodoo and Witch or Outwit Witch’s Support in such a manner that the Falcon couldn’t just swoop over and Outwit his Outwit. Back to my turn, and I make my Support roll. I need a 6, but I rolled a 3. No problem. Prob it–and I Prob myself right into a Critical Miss–the Nightmare Scenario. The Crit Miss means Voodoo takes 1 damage… and he’s done. So now my opponent has a Cloak who’s down dial quite a bit, but I’m down 2 whole figs–Voodoo and Astral Dr. Strange. My reckless opening gambit that appeared to have paid off actually didn’t, and my opponent presses his advantage on his next turn. I believe he needed a 9 or 10 to hit Scarlet Witch with Cyke–he nails the first roll, and after her defensive Prob ability, he nails a 10 on the second roll. Wanda hits him back for 1 Mystics damage, but she’s toast. Things are looking bad. My only advantage was that Cyke was now in range of the Golden Falcon. With his “Ruler” keyword (as we’ve discussed before) and the Pharaoh’s Outwit, this is definitely not a fair fight, and within 2 turns, the Pharaoh wipes Cyclops off of the board AND pushes to his superior second click (Iron Pharaoh loses Invuln on his second click for Toughness, but his Attack goes from 10 to 11 and he gains PHARAOH’S SLAVE: Iron Pharaoh can use Mind Control, but only to target characters of fewer points that himself. When he does, after actions resolve, deal 1 unavoidable damage to the character he hit with his Mind Control.) This was huge, because with Cyclops off the board, all of my opponent’s figs were could be targeted by this ability. The next couple turns were mostly about dechipping and positioning the Falcon (for me) and positioning and advancing with Cloak carrying Deathbird (for him). Yep! B. was using my own spell against me by having his remaining taxi carry his other taxi since I had given her the “Boot” symbol instead of her normal “Flight” icon. Eventually he was ready (I believe it was right after I dechipped the Pharaoh) and he had Cloak carry Deathbird right up to my Elevated Terrain perch and set Cloak right between Iron Pharaoh and Shaman, my two remaining figs, and he walked Wolvie right up to the staircase, a point from which the Canucklehead could Charage next turn. On my turn, I attacked Cloak with the Pharaoh and took him out, albeit a turn too late. As my opponent noted, “He did his job.” I’ll say! I debated attacking Deathbird with Shaman, but I decided to Barrier instead to cut off Wolverine from the fray. This was a mistake that ended up being a blessing. My opponent’s turn. 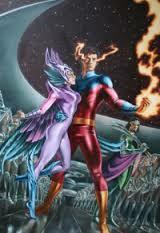 He Outwits the Barrier with Deathbird (Whoops!! Totally forgot about that!) AND marches Wolvie up to hit Shaman for 3. He dechips Deathbird and it’s my turn. Pharaoh has survived (relatively) intact. This was the break I needed. I hit Wolvie (who was now on Click 3 I believe) with Pharaoh’s Slave and use him to Flurry/Exploit Deathbird and do a Slave damage to Wolverine. Within 2 turns, Deathbird is dead and both my characters have evacuated the high ground. I miss a Support roll from Shaman on Iron Pharaoh, but it doesn’t matter. Wolverine is essentially immobile, I can start shooting at him from a safe distance with the Golden Falcon, and time is soon called. This was a grueling game, and there were several moments where I think I was really outplayed. I’m proud of myself for refocusing and getting myself out of said holes, but B. designed a great team and played a great game. He actually ended up with more overall points than me for this particular tournament. But, because of my win here, I went 3-0 and won the whole thing. –Well well well, my map exploitation strategy had one glaring hole–I wasn’t always going win the Map Roll and get Map Choice! Seems like a pretty big oversight, but the Savage Land map wasn’t entirely incompatible with my strategy anyway. Still, worth noting. –That Cloak is a monster for his points. I’m definitely going to work him into a team of my own at some point. He was useful the whole game; even when surrounded by Wolverine and Deathbird, I still had to attack him because his down dial Poison would have wrecked Shaman. Just a great piece. –Both Shaman and Iron Pharaoh took a licking and kept on ticking. These are both 5-star pieces in my book. The versatility of this team saw me through in the end. Four of the five pieces I fielded had a way to modify either their own attack values (Iron Pharaoh and Brother Voodoo) or anyone’s values (Shaman and Scarlet Witch with their Top Dial Perplex). –As proud of this team as I was, I think I learned as much or more about them by watching the way my opponents chose to attack them. 3 different opponents used 3 different strategies. A fun night. Well, all’s well that ends well! For Ninwashui’s take on the night’s events, click here. To see what Ninwashui wishes he would have played (and how he would attack the Pharaoh, Tellus and other Modern Age Meta figures), click here! See you tomorrow for the Weekly Roundup!